For other uses, see New Quay (disambiguation). Newquay (/ˈnjuːki/ NEW-kee; Cornish: Tewynblustri) is a town in the south west of England, in the United Kingdom. It is a civil parish, seaside resort, regional centre for aerospace industries, future spaceport and a fishing port on the North Atlantic coast of Cornwall, approximately 12 miles (19 km) north of Truro and 20 miles (32 km) west of Bodmin. The town is bounded to the south by the River Gannel and its associated salt marsh, and to the north-east by the Porth Valley. The western edge of the town meets the Atlantic at Fistral Bay. The town has been expanding inland (south) since the former fishing village of New Quay began to grow in the second half of the nineteenth century. There are some pre-historic burial mounds and an embankment on the area now known as The Barrowfields, 400 m (440 yd) from Trevelgue. There were once up to fifteen barrows, but now only a few remain. Excavations here have revealed charred cooking pots and a coarse pottery burial urn containing remains of a Bronze Age chieftain, who was buried here up to 3,500 years ago. In 1987, evidence of a Bronze Age village was found at Trethellan Farm, a site that overlooks the River Gannel. The first signs of settlement in the Newquay region consist of a late Iron Age hill fort/industrial centre which exploited the nearby abundant resources (including deposits of iron) and the superior natural defences provided by Trevelgue Head. It is claimed that occupation of the site was continuous from the 3rd century BC to the 5th or 6th century AD (a Dark Ages house was later built on the head). The curve of the headland around what is now Newquay Harbour provided natural protection from bad weather and a small fishing village grew up in the area. 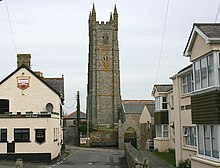 When the village was first occupied is unknown but it is not mentioned in the Domesday Book, although a parcel of land was recorded at Treninnick, which is now part of suburban Newquay. Treninnick was then part of the manor of Coswarth and consisted of one virgate (value 15d) [some 30 acres or 12 hectares] with five sheep. Crantock is the only other recognisable name in the Newquay area also recorded in Domesday, (as “Langoroch”). By the 15th century, a village referred to as “Keye” existed around the present harbour, near “Tewynblustri” (the spelling changed as Cornish evolved and is now rendered as “Towan Blystra”). “Towan” (or Tewynn) means dune or sand hill in Cornish, but the meaning of “blustri” or “blystra” is unknown. Some sources have suggested in the past that it meant boats, but this claim is not supported by modern authorities and is dismissed by Padel in his dictionary of Cornish place names. The name Towan Blystra, although often quoted as the Cornish equivalent of Newquay, was actually the name of a separate settlement some 200m away from the harbour. There is no record of ‘Newquay’ as a name ever being rendered in Cornish. The anchorage was exposed to winds from the north east and in 1439 the local burgesses applied to Edmund Lacey, Bishop of Exeter for leave and funds raised through the mechanism of an indulgence, to build a "New quay" from which the town derives its name. The new quay itself did not appear until the early 17th century. A 1904 image showing the Great Western Railway tramway at Newquay Harbour (top); the area in 2006 (bottom). The first national British census of 1801 recorded around 1,300 inhabitants in the settlement (enumerated as a village under St Columb Minor parish). The construction of the current harbour started in 1832..
A mansion called the Tower was built for the Molesworth family in 1835: it included a castellated tower and a private chapel as they were practising Roman Catholics and no church for that denomination existed in the area. The Tower later became the golf club house. After the arrival of passenger trains in 1876, the village around the port of Newquay started to grow more quickly. Several major hotels were built around the turn of the 19th century, including the Victoria in East Street, the Atlantic and the Headland, while many others were created around this period by converting former large houses which had been built originally by wealthy visitors as holiday homes, particularly along Narrowcliff. Until the end of the 19th century, the port was famous for pilchards and there is a "Huer's Hut" above the harbour from which a huer would cry "Hevva!" to call out the fishing fleet when pilchard shoals were spotted. The town's present insignia includes four pilchards, while its motto Ro An Mor is Cornish for 'from the sea'. The real pilchards now only survive in limited stocks, but a small fleet still catches the local edible crabs and lobsters. The arms of the former urban district council of Newquay were Or on a saltire Azure four herrings respectant Argent. Three churches were built early in the twentieth century, including the present day parish church of St Michael the Archangel, which was consecrated in 1911. Growth of the town eastwards soon reached the area around the railway station: Station Road became Cliff Road around 1930, and the houses beyond, along Narrowcliff, were also converted into hotels. Narrowcliff was known for a while as Narrowcliff Promenade, and then Narrowcliff Road. On some pre-war maps it is spelt Narrowcliffe. At the time of the First World War the last buildings at the edge of the town were a little further along present-day Narrowcliff, including the Hotel Edgcumbe. Post-war development saw new houses and streets built in the Chester Road area, accompanied by ribbon development along the country lane which led to St Columb Minor, some 2 miles (3 km) away. This thoroughfare was modernised and named Henver Road, also some time in the 1930s. Development continued in this direction until the Second World War, by which time much of Henver Road had houses on both sides, with considerable infilling also taking place between there and the sea. A thriving knitting industry became established in Newquay in the early part of the 20th century. In 1905, Madame Hawke began selling machine-knitted garments in a shop in the centre of the town. Debenhams was sent a sample of her work and commissioned her as a supplier. She opened a factory in Crantock Street, which has since been converted into housing. Several competing knitting companies were also set up in the town in this period . In the early 1950s, the last houses were built along Henver Road. After that, there was a virtually continuous building line on both sides of the main road from the other side of St Columb Minor right into the town centre. The Doublestiles estate to the north of Henver Road was also built in the early 1950s, as the name of Coronation Way indicates, and further development continued beyond, becoming the Lewarne Estate and extending the built up area to the edges of Porth. Other areas also developed in the period between the wars were Pentire (known for a time as West Newquay) and the Trenance Valley. Other streets dating from the 1920s included St Thomas Road, which provided the approach to the town's new cottage hospital at its far end, to be followed by others in the same area near the station, such as Pargolla Road. More recent development has been on a larger scale: until the late 1960s a passenger arriving by train would not have seen a building by the line (with the exception of Trencreek village) until the Trenance Viaduct was reached. Today, the urban area starts a good 1.5 miles (2 km) inland from the viaduct. Other growth areas have been on the fringes of St Columb Minor and also towards the Gannel. More development beyond Treninnick, south of the Trenance Valley, has taken the urban area out as far as Lane, where more building is now under way. The Trennnick/Treloggan development, mainly in the 1970s and 1980s, included not merely housing but also an industrial estate and several large commercial outlets, including a major supermarket and a cash and carry warehouse. The first phase of a new Duchy of Cornwall development began to be built in 2012 at Tregunnel Hill, which was sometimes unofficially called Surfbury after the similar Poundbury development in Dorset. It has 174 houses of traditional designs. There is now a similar but much more substantial development in progress inland, and construction on a large site known as Nansledan (‘broad valley’ in Cornish) is now apparent along the Quintrell Road. Plans were approved for the development of 800 homes at Nansledan in December 2013, but the plan now includes more than 4,000 homes, shops, a supermarket, church and a 14-classroom primary school which is due to open to its first pupils in September 2019. Following the example set at Tregunnel Hill, the buildings are again of traditional designs and all street names are in Cornish. Places like Trencreek, Porth and St Columb Minor have long since become suburbs of Newquay: it is now quite possible that by the 2030s, should present development trends continue, the south eastern edge of the town could stretch beyond the present boundary set by Nansledan and encompass Quintrell Downs, 3 miles (5 km) from the town centre. In April 2012 the Aerohub enterprise zone for aerospace businesses was set up at Newquay Airport. In September 2014, the UK's Homes and Communities Agency and the European Regional Development Fund agreed to fund the construction of a £6 million Aerohub Business Park there. A plan to launch space vehicles from the Airport moved ahead in July 2018 when a contract was signed with Virgin Orbit (for more details, see Transport). Newquay St. Michael's, a large Anglican church in the Cornish style designed by Sir Ninian Comper, was opened in 1911. There is a fine rood screen; the churchmanship is High. The church was destroyed by an arson attack on 29 June 1993, but has since been reopened (rededicated in 1996). Most of Newquay was in earlier times part of the parish of St Columb Minor. A chapel of ease already existed before 1911 but the growth in population meant that it was no longer adequate. 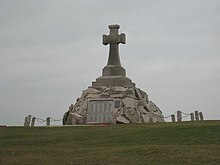 Arthur Mee in his Cornwall (King's England) describes the perpetual light maintained in the church as a memorial to the men of Newquay who died in the First World War. The stained glass windows and rood screen are also described: the main themes are St Michael, the three other archangels, and Jesus Christ and Mary the Blessed Virgin. The Roman Catholic Church of the Holy Trinity is earlier, having been built in 1903: until 1985 it was dependent on monks from Bodmin but then became part of the Diocese of Plymouth. There have also been Wesleyan and Bible Christian chapels in the town, the Wesleyan being a fine (picturesque) building of 1904. As with the rest of the British Isles and South West England, Newquay experiences a maritime climate with cool summers and mild winters. The nearest Met Office weather station is St. Mawgan/Newquay Airport, about 3.5 miles to the north east of the town centre. Temperature extremes in the area since 1960 vary from 31.3 °C (88.3 °F) in June 1976 and August 1995 down to −9.0 °C (15.8 °F) during January 1987. The bedrock underlying Newquay is the Devonian age Meadfoot Group, a succession of interbedded mudstones, siltstones and sandstones, with occasional beds of limestone. Quaternary age deposits of blown sand cover the bedrock in the western part of the town. Some mineralisation associated with the Cornubian granite batholith that intrudes into much of the peninsular is found in the western part of the town near Fistral Beach, in the form of lodes of lead and silver minerals. Newquay has been a major tourist destination for more than a century, principally on account of its coastline and nine long and accessible sandy beaches, including Fistral. Around 22,000 people live in Newquay, but the population can increase to 100,000 or more in the summer because Newquay has a large stock of holiday accommodation. Established in sections throughout the 20th century, Trenance Leisure Gardens are sited in a wooded, formerly marshy valley on the quieter edge of Newquay, stretching down to the Gannel Estuary. From the Edwardian era it provided recreation for tourists with walks, tennis courts and a bowling green, all still popular today. In the gardens, which are spanned by the arches of the stone railway viaduct, visitors have long been able to enjoy a stroll through the beautiful Trenance Gardens with their mature trees and heritage cottages, leading to the boating lake. This was dug during the depression of the 1930s as a work creation scheme. In the late 1960s, further enterprises were established by the council, including mini-golf, a swimming pool, the Little Western Railway miniature railway which opened in 1968 and Newquay Zoo, which opened in 1969. Newquay was also known for the "Run to the Sun" event, which took place for many years during the public holiday on the last weekend in May at Trevelgue Holiday Park. People visited the town in Volkswagen camper vans, Beetles and other custom cars. The last RTTS took place in 2014. Other events in recent times have included the large Boardmasters music festival, which attracts another 50,000 visitors over one weekend in early August and is held on sites at Watergate Bay (outside the urban area) and Fistral Beach. Cornwall Pride moved to Newquay from Truro in 2017, and this took place in 2018 on the last Saturday in August. The 630 mi (1,014 km) South West Coast Path runs through the town. Newquay Discovery Trail is made up of 14 Cornish slate discs, each 1 metre (39 inches) in diameter, sunk into the ground at strategic points around the town. Each of the discs features a series of 'conundrum' words carved by sculptor Peter Martin. The trail starts in the centre of town at the Killacourt. Newquay currently has one higher education campus, Cornwall College Newquay, which is a member of the Combined Universities in Cornwall Partnership. It offers foundation degree courses in Zoological Conservation, Marine Aquaculture, Animal Science and Wildlife Education and Media. Appropriately, the campus is close to Newquay Zoo in the Trenance Valley. There are also two secondary schools: Newquay Tretherras is a state-funded academy with specialist Technology College status, and Treviglas College is a specialist Business and Enterprise College. A new centre of higher education for Newquay is due to open alongside the Airport and Spaceport (see Transport for details) in 2020. This will be known as the International Aviation Academy and be attached to RAF St Mawgan. It will cater for students who wish to gain air- or space-related qualifications. Among many schools evacuated to Cornwall (notably Benenden Girls' School), 240 boys and 20 masters of Gresham's School were evacuated to the town from Holt, Norfolk, during the Second World War, between June 1940 and March 1944. Gresham's occupied the Bay Hotel and the Pentire Hotel. Between 1940 and 1944, the Royal Air Force used hotels in Newquay as a Ground school for aircrew Initial Training Wings (No 7, No 8, and No 40). Recruits were taught basic flying theory and service protocols, and were sorted into their likely future RAF trades, such as Pilots, Observers, Navigators, Wireless operators, and air gunners. The training took place in the Highbury Hotel and men were billeted in nearby hotels. Several of the large hotels in Newquay were requisitioned as convalescent hospitals for the Army, Air Force, and Royal Navy. These were the Atlantic Hotel, the Headland Hotel, the Hotel Victoria, the Fistral Bay Hotel and the St Rumons (now called the Esplanade). Devon and Cornwall Constabulary maintains a substantial police station in Tolcarne Road, and the Major Crime Investigation Team for Cornwall works from there. The modern fire station in Tregunnel Hill is run by Cornwall Fire and Rescue Service, and is the home of one of the two aerial ladder platforms based in Cornwall. The fire station has 24-hour cover during the summer and is day-staffed in the winter. A separate specialist fire service is maintained at Cornwall Airport Newquay. Ambulance cover is provided by the South Western Ambulance Service NHS Trust from an Ambulance Station in St Thomas Road. Cornwall Air Ambulance is also based just outside the town, alongside the airport. In addition, the airport at Newquay is one of ten UK bases for the Search and Rescue service, which is run by Bristow Helicopters Ltd on behalf of HM Coastguard. Newquay Hospital is also at the end of St Thomas Road, and is a local hospital catering for both in- and outpatients, with a number of clinics and a minor injuries unit. The nearest general hospital and full A+E department is in Truro. Proposals in recent years for the Newquay Growth Area, east of the present town, have included a new and larger hospital. 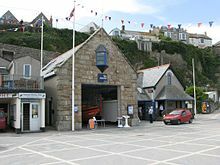 Newquay also has a 14-person coastguard rescue team based at Treloggan Industrial Park and an RNLI lifeboat station based in the harbour. Newquay railway station is the terminus of the Atlantic Coast Line from Par. The railway was originally built as a mineral line in the 1840s to provide a link with the harbour. A passenger service followed on 20 June 1876, and from then on the town developed quickly as a resort. The station is close to the beaches on the east side of the town centre. Newquay handles intercity trains throughout the summer, which include a daily service to and from London in July and August and also further through trains to London, the Midlands and North on Saturdays and Sundays between May and September. It is the only branch line terminus in Britain still handling scheduled intercity trains. Two of the three former platforms were taken out of use in 1987, but Network Rail had planned to restore one of the disused platforms to improve capacity. However, the latest draft Route Utilisation Study for the Great Western routes, published in September 2009, makes no mention of this. Instead it favours a restored crossing place (a short section of double track where trains can pass) at St Columb Road. This will depend on the progress with developing a proposed eco-town in the China clay area, much of which lies near the line. A local user group has been campaigning for the line to be upgraded, not merely with at least one additional platform to be provided at Newquay, but also for passenger trains to run from St Dennis Junction (near St Columb Road) to Burngullow, on the Cornish Main Line west of St Austell. This would require the restoration of several miles of track, and also the improvement of a China clay line which still operates between Parkandillack and Burngullow. This route was proposed in 1987 as a possible replacement for the line to Par, much of which could then have been closed. However, although the British Railways Board obtained the necessary legal powers, the plan was not carried out. The goods line which developed into the Newquay and Cornwall Junction Railway was opened in 1846 from inland clay mines to the harbour, worked by horses. Parts of the old line from the present station to the harbour are still in existence: the most obvious section is a broad footpath from opposite the station in Cliff Road to East Street, known locally as the "tram track", and complete with a very railway-style overbridge. From East Street, the line continued towards the harbour along the present-day Manor Road. The last trains ran through to Newquay Harbour in about 1924, but general goods traffic continued to reach Newquay railway station until 1964. The goods yard then closed as part of much wider changes on British Railways. However, the passenger station and its approaches were enlarged more than once, with additional carriage sidings being built at Newquay in the 1930s. The originally wooden viaduct just outside the station, which crosses the Trenance Valley, was rebuilt in 1874 to allow locomotives to run over the structure and then again after World War II to carry double track, which extended until 1964 for approximately 1 mile to Tolcarn Junction. The line is now single throughout again, but the width of the viaduct is still obvious. Tolcarn Junction itself was the point where a second passenger route diverged from the Par line between 1906 and 1963. This branch ran to Chacewater, west of Truro, via Perranporth and St Agnes, and provided through trains to Truro and Falmouth. The surviving branch line from Par, which includes other viaducts—mainly in the Luxulyan Valley—and also numerous level crossings, still brings many visitors each year from the junction at Par (on the Cornish Main Line) to Newquay. From the 1890s until 1947 the branch was owned by the Great Western Railway, then becoming part of British Railways Western Region until the late 1980s, when it was transferred to the Provincial sector of BR. This sector was renamed Regional Railways at the start of the 1990s. After BR passenger services were franchised in 1996 and 1997, the line was operated by Wales & West (originally South Wales & West) from October 1996. Wales & West was a franchise owned by Prism Rail, but Prism did not stay the course: it was taken over by National Express in early 2001 and the Wales & West franchise was then divided, its South West of England area becoming Wessex Trains. This situation lasted until April 2006, when the Wessex franchise was absorbed by the new Greater Western franchise, which is operated by Great Western Railway. Newquay Airport provides links to many other parts of the United Kingdom. It is an HM Customs port, because it also handles increasing numbers of foreign flights, both scheduled and chartered. Newquay is the principal airport for Cornwall, although there are several minor airfields elsewhere in the county. 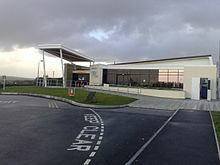 Until 2008, Newquay Civil Airport (as it was formerly known) used the runway and other facilities of RAF St Mawgan, but in December 2008 the Ministry of Defence handed over most of the site to the recently formed Cornwall Airport Limited. The first stage of the conversion into a fully commercial airport was completed in 2011, although further substantial development is planned. The handover, which was due to take place at the end of 2008, was delayed for almost three weeks because of problems in obtaining the essential Civil Aviation Authority licence, which was withheld until further work had been carried out. The name has changed several times since 2008, and the airport is now marketed as Cornwall Airport Newquay. However, the IATA code is still NQY. Usage of the airport has been rising sharply, and on summer Saturdays in 2018 there were almost 50 arrivals and departures, including flights to Germany and other European countries. Newquay is now set to obtain a licence to operate as a Spaceport, in competition with sites in Scotland and Wales, and a decision had been expected in the summer of 2017. However, the additional general election in June 2017 delayed the necessary legislation, but this has now received Royal Assent. The bid is being supported by Cornwall Council and Cornwall & Isles of Scilly Local Enterprise Partnership. The proposal also includes the related facilities offered by the Cornish space tracking station at Goonhilly. On 16 July 2018 a new partnership was announced with Virgin Orbit to create the spaceport, with the intention of launching satellites from Newquay within three years. On the same day, the government confirmed that a grant worth £2 million would be available to developing spaceports. There are regular bus services from Newquay to many parts of Cornwall, including the neighbouring urban centres of St Austell and Truro as well as Fowey, St Columb Major, Padstow, Perranporth and Wadebridge. The principal operator is First Kernow, while the town is also served by National Express coaches. The bus station is in Manor Road, which runs parallel to the shopping area in Bank Street. A scheme to upgrade and improve the bus station with the additions of a new enclosed waiting area and accessible facilities began in February 2018 and was completed in July. Newquay has two non-league association football clubs. They are Newquay A.F.C. who play at Mount Wise Stadium and Godolphin Atlantic F.C. who play at Godolphin Way. Newquay Hornets rugby football club play at Newquay Sports Centre. Newquay have a successful, four-team cricket club based at the SportsCentre. Their 1st XI currently compete in Cornwall's County One, and at the start of the century were a major power in regional cricket, winning the ECB Cornwall Premier League in 2003, boasting star players such as Ryan Driver, Tim Walton and Barry Purchase. Newquay's academy in the past 15 years has produced four full-Cornwall players — Rob Harrison, Neil Ivamy, Joe Crane and Adam Cocking, in addition to numerous County youth representatives. They have youth teams from age ranges Under 9 - Under 19. In 2016, their overseas professional was former Zimbabwean test match batsman Mark Vermeulen. In 2017, the teams all competed well in their respective Divisions, and have now gone down the route of not having a professional, instead investing in improving the ground, coaching and infrastructure. Newquay is a prime destination for touring cricket sides and the club specialise in hosting touring teams. Newquay also plays host to the Newquay Road Runners who are based at the sports centre. The resort is widely regarded as the surf capital of the UK. Newquay is a centre for the surf industry in Britain, with many surf stores, board manufacturers and hire shops in the town. At the centre of Newquay's surfing status is Fistral Beach which has a reputation as one of the best beach breaks in Cornwall. Fistral is capable of producing powerful, hollow waves and holding a good sized swell. Fistral Beach has been host to international surfing competitions for around 20 years now. The annual Boardmasters Festival takes place at Fistral beach, with a music festival taking place at Watergate Bay. Newquay is also home to the reef known as the Cribbar. With waves breaking at up to 20 feet (6 m), the Cribbar was until recently rarely surfed as it requires no wind and huge swell to break. It was first surfed in September 1965 by Rodney Sumpter, Bob Head and Jack Lydgate and again in 1966, by Pete Russell, Ric Friar and Johnny McElroy and American Jack Lydgate. The recent[when?] explosion in interest in surfing large waves has seen it surfed more frequently by South African born Chris Bertish, who during a succession of huge clean swells in 2004, surfed the biggest wave ever seen there. Towan, Great Western and Tolcarne beaches nearer the town and nearby Crantock and Watergate Bay also provide high quality breaks. Alexander Lodge (1881–1938) was an English inventor who did early work and held some patents on the spark plug. Newquay is twinned with Dinard in Brittany, France. The Headland Hotel next to Fistral Beach has been used in several films, including Wild Things (1998) and The Witches (1990). The Beatles filmed part of the Magical Mystery Tour film in Newquay. Scenes were filmed at the Atlantic Hotel and Towan Beach. ^ "Table KS01". Census 2001. ONS. ^ "Key Figures for 2011 Census: Key Statistics (Newquay Civil Parish) ONS". Retrieved 9 March 2017. ^ "Former Restormel District: local projections (September 2016)" (PDF). Cornwall Council. ^ "The Barrowfields". Newquaytowncouncilcornwall.co.uk. Archived from the original on 1 September 2009. Retrieved 16 August 2013. ^ "Archaeological work at Scarcewater reveals rare & interesting finds". Cornwall County Council. Archived from the original on 30 September 2007. Retrieved 16 August 2013. ^ "A Short History of Newquay Harbour". Retrieved 5 September 2010. ^ Pascoe, W. H. (1979). A Cornish Armory. Padstow, Cornwall: Lodenek Press. p. 134. ISBN 0-902899-76-7. ^ ""Newquay Knitting Factories"". Newquay Old Cornwall Society. Retrieved 27 July 2018. ^ "Work due to start on 'Surfbury' scheme". Western Morning News. Local World. 16 May 2012. Retrieved 9 August 2016. ^ "Duchy of Cornwall plans for 800 Newquay homes approved". BBC.com. BBC. 20 December 2013. Retrieved 9 August 2016. ^ "Duke of Cornwall unveils name of Nansledan primary school". Nansledan official website. 22 March 2018. Retrieved 18 July 2018. ^ "How long will it be until Newquay and Quintrell Downs adjoin?". Cornwall Live. 6 February 2017. Retrieved 22 April 2017. ^ "Aerohub business park at Newquay Airport to gain £6m investment". BBC News Online. 5 September 2014. Retrieved 7 March 2015. ^ "1976 temperature". KNMI. Retrieved 16 August 2013. ^ "1987 temperature". KNMI. Retrieved 16 August 2013. ^ "St Mawgan Climate". UKMO. Retrieved 11 November 2018. ^ "St Mawgan extremes". KNMI. Retrieved 12 November 2011. ^ "Newquay Weather Station - Yearly Temperature Summary Reports". Newquayweather.com. Retrieved 20 October 2016. ^ "Newquay Facts". Newquay-harbour.com. Retrieved 20 October 2016. ^ "Run to the Sun Newquay". newquay.co.uk. ^ "Distance reckoner". South West Coast Path Association. Archived from the original on 24 October 2007. Retrieved 27 February 2018. ^ Long, Peter (2002). The Hidden Places of Cornwall. Travel Publishing Ltd. pp. 78, 79. ISBN 9781902007861. ^ "Newquay Discovery Trial". Newquay.oldcornwall.org.uk. Retrieved 16 August 2013. ^ This is, Cornwall (19 May 2010). "Treasure Trail Open Weekend". West Briton. Retrieved 19 May 2010. ^ "New Aviation Academy at RAF St Mawgan to train pilots and space travellers of the future". Cornwall Live. Retrieved 17 July 2018. ^ "Newquay – Way Out West". greshams.com. Gresham's School. Retrieved 2 March 2018. ^ "Initial Training Wings/Recruit Centres etc". rafweb.org. Air of Authority (unofficial website). Retrieved 2 March 2018. ^ "P/O Thomas Forbes". www.aujs06.dsl.pipex.com. ^ "Robert Jay – Flight Engineer. No.75 (NZ) Squadron – International Bomber Command Centre". internationalbcc.co.uk. ^ "WW2 People's War - My Wartime Memories". BBC. 2 July 2005. Retrieved 20 October 2016. ^ "Newquay Hospital". NHS Choices. Retrieved 20 November 2013. ^ "Network Rail". Network Rail. Retrieved 16 August 2013. ^ "About Cornwall Airport Newquay". Newquay Cornwall Airport. Retrieved 20 November 2013. ^ "June sunshine encourages more visitors to Cornwall". Cornwall Newquay Airport. Retrieved 18 July 2018. ^ "Spaceport Cornwall website". Spaceport Cornwall. Retrieved 22 April 2017. ^ "Cornwall Spaceport is a go and this is what it will mean for you". Cornwall Live. Retrieved 16 July 2018. ^ "One giant leap: Vertical launch spaceport to bring UK into new space age". Department for Transport. Retrieved 16 July 2018. ^ "Local Area". Newquaytowncouncilcornwall.co.uk. Archived from the original on 1 March 2010. Retrieved 16 August 2013. ^ "Surfing The Cribbar Newquay, Cornwall". Retrieved 1 July 2010. ^ "Fistral Beach - North Cornish Coast, Cornwall Beaches". 50.418253;-5.097656: Cornwall-beaches.co.uk. Retrieved 16 August 2013. ^ "Little know facts about Newquay". 10 May 2007. ^ Silver, Katie (6 February 2012). "Perfect for a Bond villain: One of Britain's most exclusive homes perched on a rock goes on sale for £1m". Daily Mail. London. Retrieved 16 August 2013. ^ "Phillip Schofield Online". Schofieldfans.co.uk. Retrieved 16 August 2013. ^ Guardian, Cornish (8 February 2012). "Scrap Twinning Link Says Ex Mayor". Cornish Guardian. Retrieved 9 August 2016. ^ "Most Popular Titles With Location Matching "Headland Hotel, Newquay, Cornwall, England, UK"". IMDb. Retrieved 20 November 2013. ^ Duncan, Fiona (9 August 2016). "The Headland Hotel Review". Retrieved 9 August 2016 – via telegraph.co.uk. ^ "The Beatles, John Lennon, Paul McCartney, Ringo Starr and George Harrison, Photo stock Archive by Chris Walter". Photofeatures.com. Retrieved 16 August 2013. ^ Oliver, Amy (15 October 2012). "The Magical Mystery Tour of Newquay". The Mail on Sunday. Retrieved 9 August 2016. ^ "Film and TV Locations in Cornwall". IntoCornwall. Retrieved 23 November 2017. Wikimedia Commons has media related to Newquay. Wikivoyage has a travel guide for Newquay. Wikisource has the text of the 1911 Encyclopædia Britannica article Newquay.